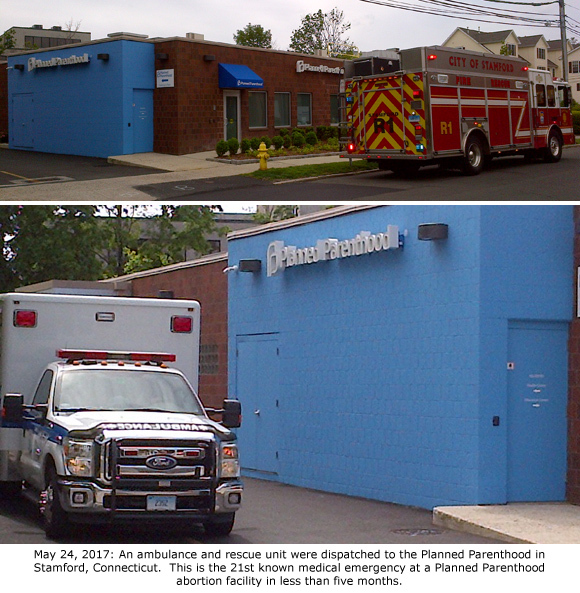 Stamford, CT — For the second time this year, an ambulance was dispatched to the Stamford Health Center Planned Parenthood, an abortion facility located in Stamford, Connecticut. This follows a previous medical emergency that took place on February 15, 2017, in which an ambulance was called to the Planned Parenthood facility for a patient suffering a seizure. Photos and a radio traffic recording was included in a February Operation Rescue compilation video featuring 18 medical emergencies at Planned Parenthood since January 2016, which was meant to persuade Washington legislators to defund Planned Parenthood. Since then, Operation Rescue has documented a total of 48 medical emergencies at Planned Parenthood abortion facilities since January 2016 – twenty-one of which took place within the first five months of 2017. Please contact your Senators and demand that they immediately #DefundPlannedParenthood. Pick your state at this link for contact information.